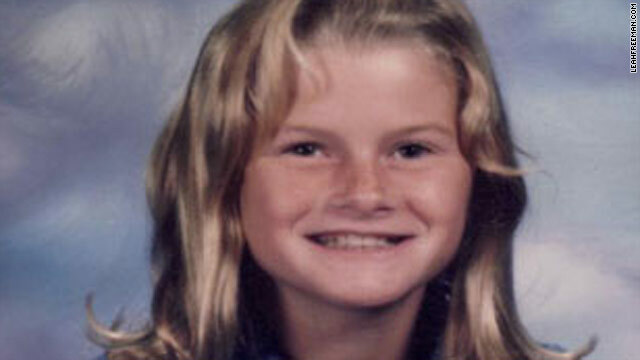 Leah Freeman, 15, disappeared on June 28, 2000. Her body was found a month later on the outskirts of a neighboring town. New York (CNN) -- Leah Freeman, a 15-year-old high school sophomore, vanished from the street near her home in Coquille, Oregon, leaving one tennis shoe behind on the sidewalk. Police believe she was snatched by someone while walking home from her best friend's house as it was beginning to get dark on June 28, 2000. Leah lived with her grandparents, her mother and her older sister, Denise. More than a month later, her body was found on the outskirts of Fairview, a neighboring village in Oregon. "The last time I saw my daughter was that afternoon," said Leah's mother, Cory Courtright. "She was so happy. She and her boyfriend were washing the windshield of his car and horsing around with the wet sponge. It was 4 p.m. and she jumped and kissed me on the cheek and told me she loved me before [she] took off." Courtright said Leah's boyfriend dropped her off at the home of her best friend, Sherrie Mitchell, and was to pick her up at 9 p.m.
She said she later learned from the Mitchells and from police that the two friends had a spat because Sherrie's mother wouldn't let her go jogging with Leah after dark. Leah overheard the argument between her friend and her mother, and then the two girls argued. Leah angrily left the Mitchell home before her boyfriend arrived to pick her up. She was so happy ... She jumped and kissed me on the cheek and told me she loved me." At about 10:15 p.m., the boyfriend called Courtright from the Mitchells' house to ask whether Leah had arrived home. Friends of Leah's boyfriend later told police and her family that he had been partying at Johnson Mill Pond before he arrived to pick up Leah. According to the police and Courtright, "partying at the pond" meant smoking marijuana. Leah and her boyfriend often argued about his occasional use of marijuana. It was a bone of contention between them, says Courtright. Courtright reported Leah missing to police the next morning. Police found Leah's boyfriend and his best friend at a relative's home in the neighborhood, where they had been with Leah the day she vanished. According to Coquille Police Chief Mark Dannels, the front porch was littered with empty beer cans. Police also noticed a white men's tank top, which investigators initially assumed belonged to one of the boys. Later, police learned that Leah had been wearing a white men's tank top when she vanished. When police returned to the house, the tank top was gone and the place was cleaned up. Police executed search warrants on the boyfriend's family's home and vehicles. They discovered that the trunk of the car he drove had been recently gutted. His father told police there had been a fuel leak so the trunk liner, the spare tire, jack and tire iron had to be removed, Dannels said. Police also learned from neighbors that the family held a bonfire in their yard the day after Leah disappeared. The mate to Leah's lost shoe was found along a dirt road in Fairview nearly a week after she disappeared. Forensic testing showed blood spatter on the bottom of the shoe. The sample matched Leah's blood and experts determined a pattern consistent with medium- to high-velocity blood spatter, which can happen when an object -- a bullet or a car, for example -- hits a person while traveling at high speed. We are holding back information on the exact cause of death to protect our investigation. Leah Freeman's body was found on August 8 in the woods along the dirt road where her shoe was found. "We are holding back information on the exact cause of death to protect our investigation," Dannels said. He also would not comment on whether Leah's body was fully clothed or whether she had been sexually assaulted. Police have not publicly named any suspects. However, Dannels said Leah's boyfriend and friends are a focus of their investigation. "Recently, the boyfriend and his family came to us saying they wished to clear their son's name and wanted to cooperate and help in our investigation," Dannels said. CNN's calls to the boyfriend and his attorney were not returned. In January, a cold case team of more than 20 members from several jurisdictions was appointed to reinvestigate the case. Asked why the case is being re-investigated after 10 years, Dannels told CNN that witnesses are more mature now and are coming forward to help provide more information. And, he said, newer forensic technological advances allow police to re-evaluate the evidence gathered 10 years ago. "We feel strongly that we will have an arrest in this case," Dannels says. A $10,000 reward is being offered to anyone who has any information leading to the arrest of those responsible for Leah Freeman's death. The tip line for the Coquille Police Department is 541-396-2114.